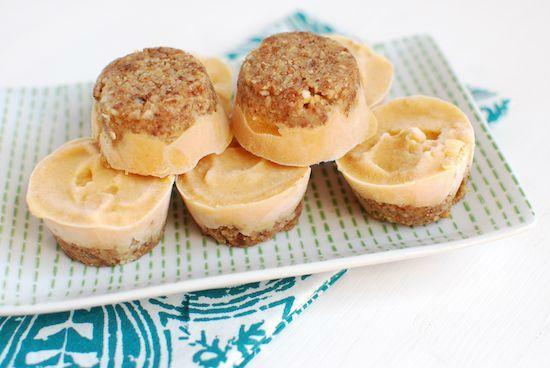 These Frozen Yogurt Pumpkin Pie Bites are a healthy pumpkin dessert made with yogurt, pumpkin, almonds and dates. Tastes like pumpkin pie! How’s that for a title? These were not what I intended to post today, but this week I was bitten by the pumpkin bug. I know some of you still think it’s too early for pumpkin, but at least I made it to September. I found a can of pumpkin in my pantry and I just couldn’t get over the need to make something with it. I thought about making one of my pumpkin recipes from last year, but I decided I wanted my first pumpkin recipe of this fall to be a new one. So I put on my thinking cap and here’s what I came up with. Honestly, I wasn’t sure what to call these. They involve homemade frozen yogurt. They also have a crust. They’re like a mini pumpkin pie…but frozen…and made with yogurt and nuts. Call them what you wish. I call them delicious. 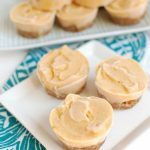 A bite-sized frozen treat that tastes like pumpkin pie! In a food processor, combine the almonds, dates and cheerios and process until well ground. Add just enough milk for the mixture to come together into a ball (i’d start with 2 Tbsp and add more if it’s still too dry). Press mixture into 12 mini muffin tins. In a small bowl, combine the yogurt, pumpkin (start with 1/2 cup and add more for stronger pumpkin flavor), cinnamon and vanilla and mix well. Add maple syrup until desired sweetness is reached (start with 2 Tbsp and add more if needed, keeping in mind the crust will be sweet). Spoon mixture into muffin tins on top of crust. Freeze for at least 4 hours, then use a knife to remove from muffin tins. Store in a container in the freezer. When I made these, I poured the yogurt mixture into an ice cream maker first and let it thicken, and then pressed into the muffin tins…but now that I’m looking back on it, I don’t really think it’s necessary to use the ice cream maker. You could probably just spoon the yogurt mixture into the muffin tins on top of the crust and freezer. Since I was kinda working on a whim while making these, I used mine…but when I make my froyo bites I just freeze yogurt in ice cube trays so I’m sure it will work just fine. Like I mentioned above, this is a taste as you go recipe. I gave some of the quantities in ranges because they will depend on other factors. For example, if your dates are nice and sticky, you may need less milk than if they’re a bit dried out. If you don’t want the frozen yogurt part to be super sweet, you’ll need less maple syrup. Just remember that the crust part is quite sweet, so you might not need to make the frozen yogurt part as sweet as you would if you were eating it on your own. As I said in the notes, I used Honeynut Cheerios, mainly because I was out of graham crackers and I had a box I’m trying to use up. You could try subbing a couple of graham crackers for the Cheerios, or using oats instead. Just remember if you use oats that the crust will be a bit less sweet. These are a bit tricky to get out of the muffin tins, but let them sit a few minutes and then if you can get a knife down the side, they should pop right out! Yum! My favourite pumpkin recipe would have to be pumpkin bread, I love to add a banana or two into the mix to make it extra moist. It’s such a shame I can’t get canned pumpkin here, I hate limiting pumpkin recipes to only Fall. oh gosh, pumpkin bread…so darn good! agreed! froyo for the win! Okay, without a doubt, the most unique twist to pumpkin! I grew up eating pumpkin strictly savoury style- so I’m enjoying the sweet variations! gotta get a good mix of both in my opinion! What a fab idea! I think I might make them as fro yo bites without the base and add some nuts to it – especially good if I have small amounts of pumpkin left to use up! So I’m not on the pumpkin bandwagon yet this year. It just seems way too early! BUT these would be a great way to sneak some in since it is fro-yo and that’s summery. yeah! we’ll call this an in-betweener recipe! THE PUMPKIN RECIPES ARE BACKKKK!! These look really good. I’m not on the pumpkin bandwagon just yet. I honestly bet I will be when there is a bit more of a chill in the air, you know? for sure. bring on the fall weather! pumpkin pie and froyo. The perfect combination! My favorite pumpkin recipe is classic pumpkin pie. Without a doubt, my favorite part of Thanksgiving! These look like a perfect late summer, pining-for-fall treat! Girl, I feel the same way about needing to crack open the pumpkin! 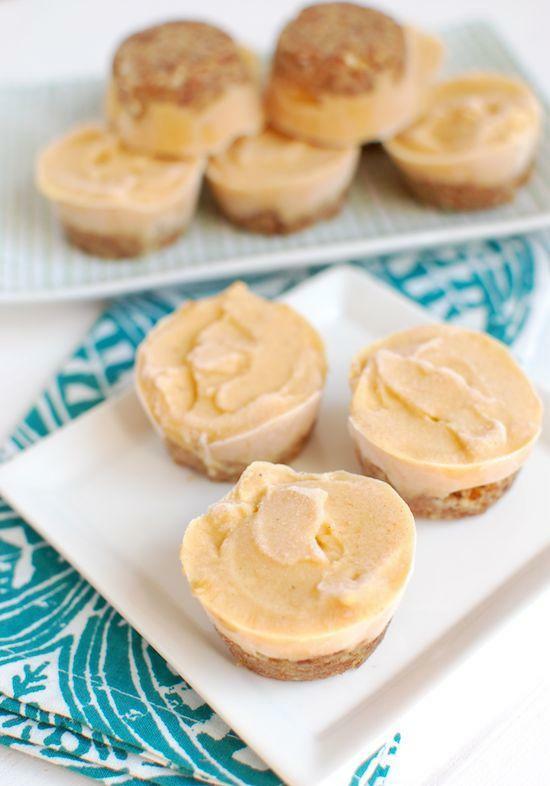 I have a really similar recipe on my blog for Skinny Mini Pumpkin “Cheesecakes” (http://eat-spin-run-repeat.com/recipes-2/?recipe_id=6032650) , only mine have a crust that has an oat base. I really love your nut version though because I’m sure the texture is amazing! Can’t wait to try it out! These look fantastic! I love pumpkin everything (go figure!). But seriously, as a kid, for my dessert I would ask for a BOWL OF PUMPKIN. My mom would top plain pumpkin with a little brown sugar and raisins and that was better to me than the ice cream my brothers were eating. that’s a strong pumpkin love! love it! I love your brain! Can’t wait to give these puppies a try! Yes! i just wanted to bridge the summer to fall gap for you guys! Perfect treat! These would be super fun to have for a dinner part too. Thanks for sharing. Ha, I love that you used honey nut cheerios instead of graham crackers . . . . I always am out of a specific ingredient too and have to get creative! It’s never too early for pumpkin in my opinion! These bites sounds absolutely wonderful! I’m totally pinning! I have a feeling I’ll eat them all up pretty quickly! I was already excited to start eating pumpkin-flavoured things again – but that just doubled with this recipe. Looks so good! since it’s still 99F in TX, i’ll make these and pretend fall is coming. I love to use Honey Nut Cheerios in crusts. These sound absolutely fabulous. Going to schedule to share on Facebok. I know my followers are going to love this inventive recipe. love this frozen recipe – this is basically a breakfast/snack/dessert into one. Can I hire you to come to my house and cook for a week? ALL of your recipes are right up my alley. These sound amazing, Lindsay! These look delicious! I love pumpkin bread, that’s probably my favorite! These look amazing, I can’t wait to try them! I need to go stock up on canned pumpkin this fall, while it’s so easy to find. I have been loving overnight oats for breakfast, so I want to try mixing in a little canned pumpkin and topping with nuts. oh so good! pumpkin oatmeal is a staple when it gets a little colder! I think that September is fair game for pumpkin. Any sooner, and we’re just robbing summer! 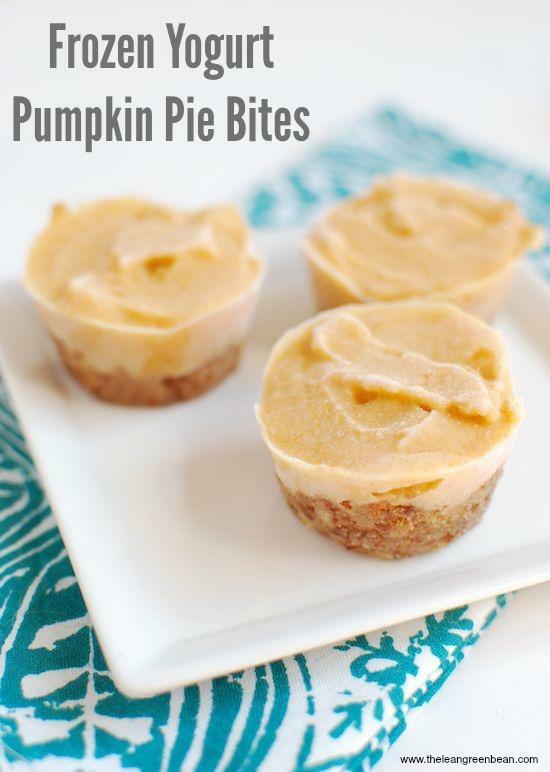 These look delicious – pinned for a reminder to make them later this fall! I am ready for pumpkin oats & pumpkin pie. I love the addition of the Honey Nut Cheerios…Those were a favorite of mine as a kid…Thanks for sharing! oh my gosh, this is brilliant. this is going to take my frozen yogurt obsession to the next level. Yum! You had me at pumpkin!!! I love pumpkin ice cream but this is a great alternative! I really like putting pumpkin in my smoothies this time of year too! These look amazing!! One of my favorite treats is pumpkin pie ice cream, so I feel like this would be a great little dessert. Omg these look amazing! When I stark cooking with pumpkin, these are happening! These bites look so refreshing! Pumpkin pie has always been my favorite pumpkin treat! I’ve been bitten by the pumpkin bug, too. I found 2 cans of pumpkin and was just going to make tons of faux Pumpkin Spice Lattes, but now I think I’ll make these and a little PSL. They look delish! These look so good. I’ve been craving pumpkin and need to go get some. This is a definite must make. I think my favorite pumpkin recipe is actually pumpkin and butternut squash ravioli with just a brown butter sauce. Everything about this sounds delicious! I will definitely try this out and it is perfect for the fall season! These look yummy! I love this time of year when there are plenty of apples and pumpkins. My favorite pumpkin recipes are pumpkin pancakes and pumpkin soup. Such a great idea! These look and sound delicious! Love this!! What a great summer->fall transition recipe! These look so good. I have gestational diabetes and am on a low-sugar, low-carb diet. I make my own yogurt so I can control the sugar content. I have special “sugar” to use and sugar-free maple syrup. I love pumpkin stuff too. I don’t think I can use the dates but will make substitutions as needed. Thanks! I use silicon molds for all of my bite-type of recipes (and many other things). So easy to pop out, and there’s no risk of scratching the surface with a knife. I’ll be making these soon! These looked so good I had to try them! Just popped my first batch into the freezer, so we’ll see in a few hours how they came out. I used graham crackers , peanuts, and gingersnaps for the crust, and I added a few shakes of nutmeg and clove as well. For the filling, I used honey and added cinnamon, nutmeg and clove as well. Tastes just like pumpkin pie! Hello,I hear ya on the pumpkin puree. I opened a can on the weekend and I’m still trying to get through it! This recipe for pumpkin pie bites will definitely help me use up the rest! [WORDPRESS HASHCASH] The comment’s server IP (66.135.48.167) doesn’t match the comment’s URL host IP (76.74.254.123) and so is spam. [WORDPRESS HASHCASH] The comment’s server IP (192.185.4.128) doesn’t match the comment’s URL host IP (192.185.46.3) and so is spam. [WORDPRESS HASHCASH] The comment’s server IP (184.168.27.129) doesn’t match the comment’s URL host IP (50.63.98.1) and so is spam. [WORDPRESS HASHCASH] The comment’s server IP (65.18.121.242) doesn’t match the comment’s URL host IP (104.25.47.7) and so is spam.